So we’re six months into the year, and that means the sixth entry in my personal Cartographer’s Annual challenge: to use every issue of the Annual in the same month for a meaningful map. This months Issue is another overland style, a fun comic map style, inspired apparently by Sidekickquests.com (check it out…). However, as a style, it didn’t really seem to suit mapping in Tolrendor. Hmm, what to do for the Challenge then!!? Well, some time ago, my son decided he wanted to try his hand at building his own world, and of course wanted to use the same tools I do i.e. Campaign Cartographer 3. Now CC3 is many (great) things, but what it isn’t is a program with a short learning curve! So I set him up with the Overland Hex map style from a previous Annual (July 2010 in fact…), as this made it possible to produce map simply by clicking in the hexes with the desired symbol, without too much dependency on more complex drawing tools. He really enjoyed this and produced a lovely map of ‘ScaryLand’!! The style was quick and enjoyable to use, with bright and bold terrain tools that blend in nicely, and the comic symbols which are really fun to use. My only gripe would be: more symbols please!! 🙂 For example, there is only one style of tree symbols (although it comes in a nice range of single trees and copses etc). It would be really good to have some more options here, such as northern fir, or steaming jungles! The comic-style also cries out for some different types of buildings e.g. desert tents, eastern style cities etc. With what’s there however, you can certainly produce a great map, especially as all the symbols have really nice varicoloured versions, so you can mix it up a bit (which is exactly what I did for northern forests and jungles!). I also found a few of the symbols from the standard CC3 Vector Colour style worked quite well (Marsh and Oasis symbols). 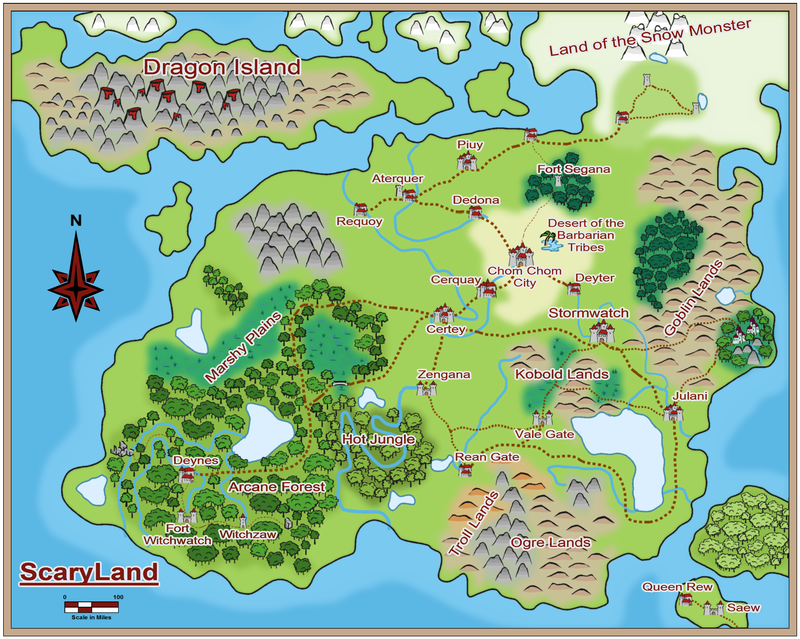 This entry was posted in Cartography, Columns, Roleplaying with Kids, The Annual Challenge. Bookmark the permalink.